Haute Couture Autumn-Winter 2010 - 2011. Valentino launched the Autumn - Winter 2010-2011 collection at 8 Place Vendome, Paris on a warm Wednesday evening in early July. As a crowd of fashion followers and international photographers greeted the celebrity V.I.P's and private patrons of Valentino Haute Couture, a fabulous new collection capturing the essence of Valentino style and happyness was unveiled. I was lucky enough to see how well the collection had been received by the invited guests and saw Mr Valentino making the final touches to the show a few hours before. Clare Danes, Jessica Alba and Elizabeth Hurley sat alongside Anna Wintour, Suzy Menkes (Herald Tribune) and Hillary Alexander (Daily Telegraph). Another person with a keen eye for fashion, Mario Testino also took in the collection. Here are a few key looks that Valentino have kindly sent so that I can bring them to you. This is an Autumn of light frosted pastels at Valentino. But ladies are kept warm with layers of delicate fabric embellished with intricate detail. Wraped in the intricate delicacy the Valentino Lady of this coming Autumn - Winter season is a picture of effortless grace as she steps out into the Autumn chill. While it cannot be doubted that this is a young look; there is a joyous playful spirit to the collection which shows that it can be worn by women of any age and bring out the young playful girl inside. I think, like Chanel said, clothes make you notice the person. They also uncover parts of our character that may lay hidden sometimes and a beautiful outfit like the ones above, will make us smile on the inside and out. I think these pieces will bring a lot of pleasure to the ladies who wear them. You have to carry a smile in your heart to be truly beautiful and these wonderful Valentino pieces connect to the heart for me. This is a collection accentuating the youthful happyness and spontineity that lives in us all. Maria Grazia Chiuri and Pier Paolo Piccioli. These four pieces are a selection of the evening and party pieces. Look 1 is very demur and I love the front Bow-tie detail. It would be perfect to wear to a Black- Tie event with a special man, or would look fun by itself. I love the ruffling detail of Look 2 and I love the large White rose. Look 3 is a dress in my favourite Scarlet Red but I suspect this is rosso Valentino. I'm very into the graduted layering effect that this piece shows and would pick this as my must have piece from the collection. Look 4 is a creative design that uses the beauty of the rose to full effect. Dark and mysterious, these Black roses invite the eye of the observer and show the true skill and beauty of Haute Couture. Beyond these pieces there are some fantastic floor-length Haute Couture gowns that are breathtaking in their design. I hope that you also get to see some of these and, if possible for you, I suggest you visit Valentino to find out more. As this collection moves from day into evening, this leads smoothly on to an exciting new Chapter for the House of Valentino. Haute Couture week was a busy week for all the Houses and for many like little me running round Paris but for Valentino July 2010 was extra special. Following the launch of the Haute Couture collection Valentino held a wonderful dinner party for many friends to celebrate the foundation of the Valentino Archive. Valentino Archives Dinner Party at Chateau de Wideville, Versailles. 9th July 2010. Mr Valentino and Giancarlo Giammetti', have celebrated the opening of the Valentino Archive at Chateau de Wideville on the outskirts of Paris. This archive represents a history of the House of Valentino from it's foundation to the present. Forty five years of the House's History are stored in a High Tech format. This was also made possible with the assistance of researchers from the Institut de Mode et Textile aux Arts Décoratifs in Paris. Over 200 sketches dating from 1958, when the House of Valentino opened to 2008 when he showed his final Haute Couture show are laid out to view in rooms of the Chateau. The drawings are accompanied by pictures of some of Valentino's most famous clients including Elizabeth Taylor and Jacqui Kennedy-Onassis. It is open by appointment to special guests from this Autumn and open to students of Fashion from 2011. I think it's wonderful that students will be able to learn about the creation and history of Valentino style in such an amazing setting and very thoughful of Mr Valentino and Mr Giammetti to initiate this new aspect of Valentino. The guests included many who had been at his Haute Couture show earlier such as Natalia Vodianova and many more such as Gwyneth Paltrow and her children who ran through an enchanted maze as the sun set. More fashion faces and good friends of Mr Valentino included Nati Abascal, Eugenie Niarchos and Bianca and Coco Brandolini. A little way from Versailles Paris Haute Couture week closed with this beautiful party looking back at the History of the House of Valentino and looking forward to many successes yet to come. The dancing lasted until the early hours and a new day dawned for Valentino. 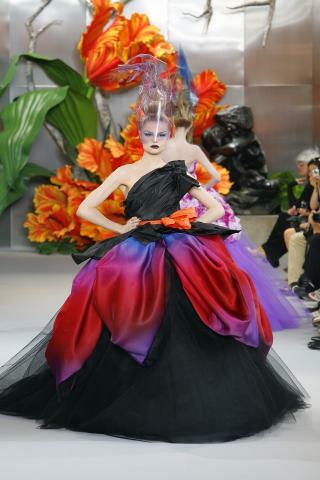 John Galliano showed his latest collection for Christian Dior in the gardens of the Musee Rodin. The collecetion was inspired by the childhood home of Christian Dior 'Les Rhumbs' at Granville in Normandy. Here the young Dior learnt his first lessons of colour and coordination in that traquil haven sat perched majestically on a cliff-top over looking the sea. The gardens where filled with giant flowers to make the models perhaps appear the same size as the flowers that they where walking amongst. This brought several things to mind for me as the modes started to walk out. The garden at the Chelsea Flower Show (see the May 2010 page) designed in honour of 'Les Rhumbs' and Fairy tale of Thumbelina, the tiny flower sized girl who wore clothes made of flower petals becasue she was so small. The collection opened with this beautiful dress to the left. It's amazing a wonderful bold purple with the brilliance of colour that is found in nature. I love the green grass tie that is repeated in differnet colours through the collection. 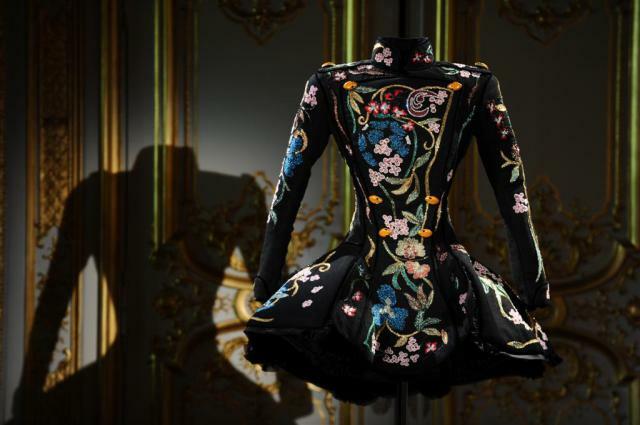 It gives the impression of the model being wrapped like a flower and shows the woman's waist beautifully. 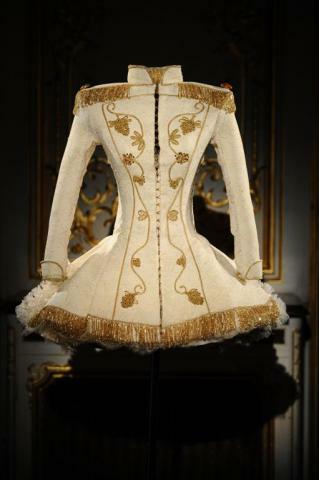 This is Haute Couture that accentuates the curves of a woman's body. A key feature of this collection is the way that the clothes drape around the figure in the manner of petals from the flower. Layers fall and overlap just as in nature and clothe the body is soft luxury. The three outfits below are simply fantastic Lady-Chic in the classic style of Dior. All three use the grass-tie to show the waist and several of the models int he collection are wearing gloves to show this is stylish day and possibly evening wear for the smartest girl about town. Flowers are everywhere. In Look 1 the skirt is one full flower head and the jacket itself is trimmed with petal detail in firey colours of the giant tulip's behind the catwalk and reminicent of the Tulip Line Christian Dior collection of 1953.
piece with it's scarlet red tie and floating along in paradise. Look 21 (C) Christian Dior. This look to the left ushers in the pieces of the collection that are guraenteed to draw gasps from the audience every season at DIOR. 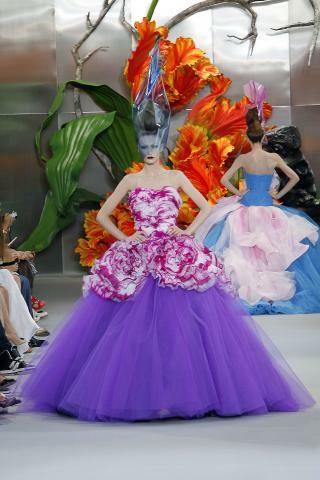 The Organza Haute Couture dresses. Keeping with the floral theme of the garden at 'Les Rhumbs' these pieces fall in beautiful graded layers over the figure just like petals that are wrapped around the golden heart of the flower. I love the colours in this look and feel it is a piece that I would very much like to wear. The cut and colours would suit any woman's figure and make you feel like a goddess. John Galliano's creative genius is that he makes extraordianry detailed clothes that, although precise in their measurements and detail have the universal ability to adapt to the frame of any woman. This, I feel, is one the true goals of any couturier. for me are classic autumn-winter pieces. I can imagine them at masked and un-masked balls anywhere in the world. I love the contrast of the flashes of brilliant colour and the somber black. The volume of the dresses is so beautiful and I can't help wondering what it would feel like to wear a dress of those demensions. For most women they will experience somthing similar when they have a wedding dress. These two pieces I leave you with as for me they are the two most stunning from the collection. The full skirts are so bright that the colours are, for me, electric blue and and lilac. The floral moteifs that cascade beautifully over the skirt are hypnotic in their detail and beauty and show the craftsmanship that is pure Haute Couture. 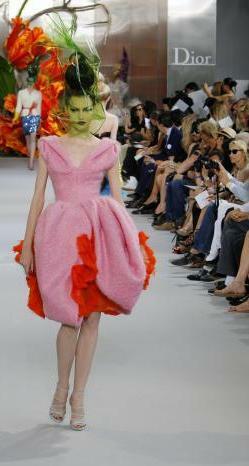 This is Beauty, Grace and Style at it's height flowing down the catwalk in Paris. I was invited to see the Autumn - Winter 2010 Haute Couture collection from Worth at The Ritz in London during London Fashion Week Sep'10. After making my way down many long corridors with the sound of harp music and the smell of beautiful flowers in the air I came to the beautiful Blue Drawing room where Worth had installed their collection. It was a amazing to see the captivating pieces in display in London, the original home of Worth over 150 years ago and at the Ritz these outfits seemed to fit perfectly into place. I was fortunate enough to spend some time talking to the designer Giovanni Bedin. 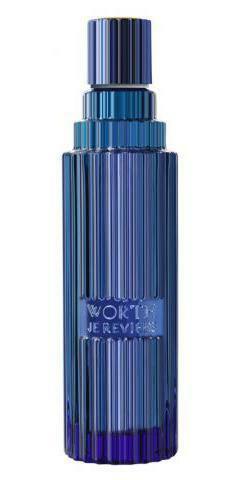 The collection is the second for the re-launched House of Worth. 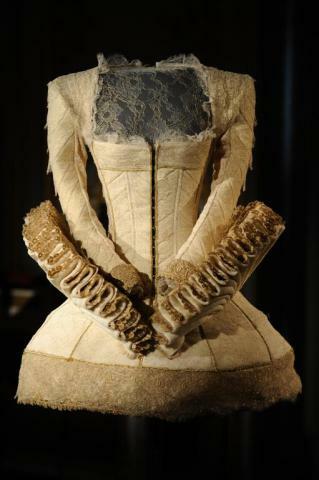 He explained his interest in the construction of the garments with many traditional components of the underlayers of the pieces given prominence on the outside such as the layers of under skirting. The piece to the left was my favourite from the collection. I sat near to it in the drawing room and stared for quite a while at the intricacy of the work. The floral embroidary uses beading with crystal detail at the centre of the flowers. stretched to give it a flexibility and lightness that allows the piece to move with the body of the wearer. The theme of this collection to me appreared to be the fitted, structured, sometimes military-esque jacket. Reqorked into a large number of beautiful pieces this gave ample opportunity to show the finesse of Haute Couture fashion. Piece 2, below, features sumptous broccade detail. For some reason I look at this and I envisage Daphne Guinness wearing it. Something about the bold neat form of the pieces makes me think of her. (C) Worth Piece 2. (C) Worth Piece 3. Piece 3 again features the signature layers of soft lace underskirt and the coat dress that rests gently on top of it is composed of an amazing fabric. It looks quilted except it's not. It appeared to me to be a very detailed embroidery piece and for some reason it reminded me of india. 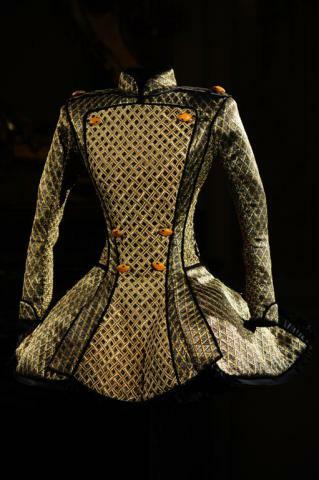 The whole piece seemed to shimmer and has a link to the snake-head buttons placed at the front of the dress. I think you can look at the fabric of this piece and see a replication of the skin of a snake in the diamond-shapped patterning. Worth has been re-born in the 21st Century and as a new generation of clients come to understand this house not just as a part of fashion history but as a part of modern fashion now. The only person I know who knew of Worth in any great detail was my gandmother, now in her nineties. To her it was a name just as familiar as CHANEL or Dior but to people of my generation it is a name from the past that you may discover, as I did, only a few years ago at the V&A Golden Age of Couture exhibit. I am delighted that a pert of our collective fashion heritage is being restored and given new life. par with the couture pieces. sweethearts but now it could very well be the motto of the House itself. parts of the dress that where traditionally hidden. itself in the 21st Century. season of Fragrance related events in September 2010. (C) Worth Piece 4.